With a nod to the 70s (as seen on the catwalks), the Studio 24 collection includes perfect cross-seasonal garments, which can be layered and worn throughout the year. The perfect match for our unpredictable and often unseasonable weather. Garments feature the trend for top-down knitting, where instead of starting with the lower hem, you knit from the neckline downwards. Why not? The collection is photographed in sumptuous jewel colours of teals, greens and purples, with a dash of ochre and burnt orange. Garments to choose from include cropped cardigans, long line vests for layering, and short jumpers which look great with blouses peeping out. One of the highlights is the Margo pattern, shown here. Margo is a great example of the cleverly constructed garments in the collection. This stunning top in Kidsilk Haze is formed of a long strip of stocking stitch with the softly draping cowl section worked in rib around the top. 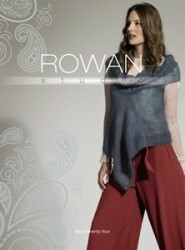 Studio 24 features a range of favourite Rowan yarns including Rowan Kidsilk Haze and Rowan Wool Cotton.